Pop singer Chris Brown was sentenced Tuesday to serve five years probation and more than 1,400 hours in "labor-oriented service" for assaulting his pop star girlfriend, Rihanna. Los Angeles Superior Court Judge Patricia Schnegg said in the sentencing she wants to see Brown conduct “actual physical labor, as opposed to some type of community service.” The sentencing was delayed earlier this month because documents detailing Brown’s proposed community service plan in Virginia, where he maintains a legal residence and wants to serve his sentence, had not arrived in time for Schnegg to review them. Brown’s probation will be overseen by the state of California, the judge said. He must also complete domestic violence counseling. Schnegg has said Brown could apply to have his supervised probation transferred to Virginia and complete his community service there, but it would have to meet the court’s standards. Rihanna was not expected to attend Tuesday’s hearing, which had been set for Thursday before being moved up with short notice. Watch Brown arrive for sentencing » Rihanna — whose real name is Robyn Rihanna Fenty — appeared briefly in court in June after Brown admitted in a plea deal that he was guilty of a felony assault. Brown’s probation requires that he complete domestic violence counseling. 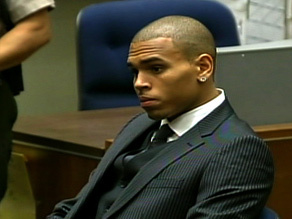 The judge said Brown cannot have contact with Rihanna again until it is completed.